We are now living in the world of DIYs and every one of us is showing interest towards fulfilling their needs with the things they have made. Beauty products are also among the many DIY products that people show interest towards and if you are also one such a beauty conscious personality, then you will need these recipes for the homemade face scrub. The scrub is definitely needed for your skin to keep it clean and clear from the dirt and dust from around the atmosphere. So, now take a look at the various different face scrub recipes with various ingredients that you can try at home easily. Baking soda has many different uses and it is one such a great ingredient that has in store many uses for us. This has many non–food related uses as well and the face scrub is one among the many. The grains present in the baking soda work as gentle exfoliate with just correct in size. In fact, many say that it also has the ability to clear acne on your skin. So, this works well on your skin issues as well and thus can be a great ingredient for a face scrub. All you need to do is just mix a little amount of baking soda in your facial cleanser to make it an exfoliating cleanser, and remember that the facial cleanser is an optional ingredient and you can skip it and also make paste just with baking soda and water. You can gently rub it on your skin and leave it for 5 to 10 minutes before washing it off. This is the best face scrub for oily skin. Honey is another such really great ingredient that has multiple benefits. Honey works great on your skin and helps you to get rid of blackheads, so a face scrub with this ingredient will be a cool idea. All you need to do is just mix up all the ingredients together well in a bowl and then transfer it into a tight lid bottle jar. 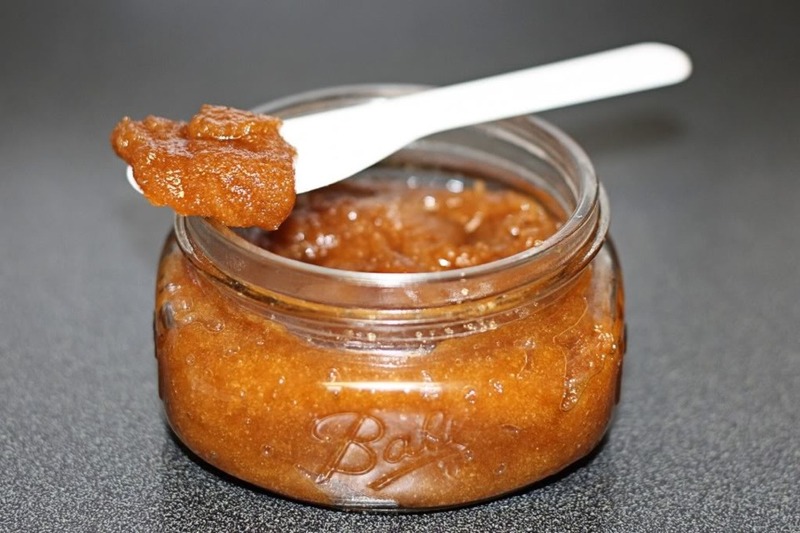 If you take 2 cups of brown sugar, then you must add ½ cup of olive oil and ¼ cup of honey, 1 tablespoon of vanilla, ¼ tablespoon of cinnamon to make the perfect homemade face scrub recipe. You can also add a teaspoon of vitamin E oil to preserve it for more time. And you can use it like any regular scrub. 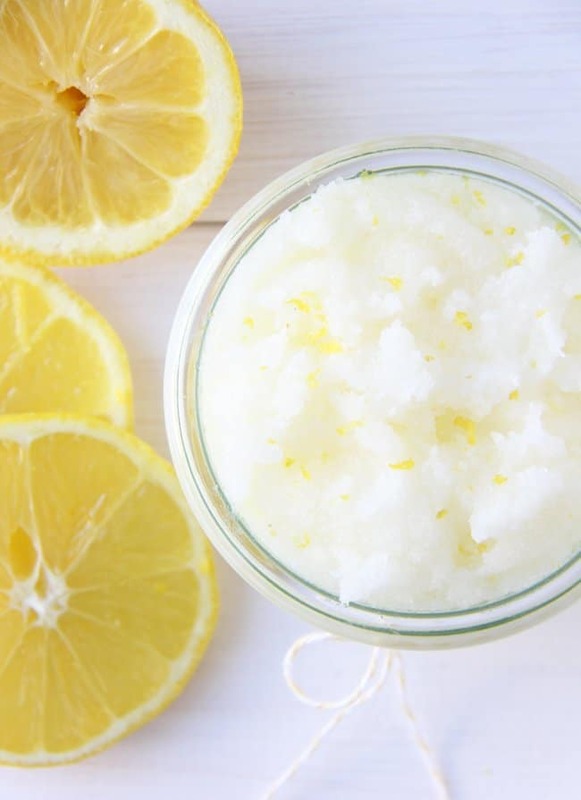 Lemons are another most used and easily available ingredient at everyone’s home and this ingredient can also be turned into a very much useful face scrub with a simple and easy to make recipe. Combine 1 cup of sugar with ¼ cup of coconut oil and then add a few drops of lemon juice and remember you can also choose to add lemon essential oil if you think you need some nice aroma in your scrub. You can replace the lemon juice with lemon essential oils. Mix them all well together. Then store it in a jar and use it once or twice in a week for a smooth and glowing skin. This is yet another simple homemade face scrub recipe for you to try if you are beauty conscious. The most casually available ingredient in everyone’s home coffee is the main ingredient here. Coffee helps in keeping your skin firm and prevents it from early ageing. Take 1 cup of ground coffee beans and add ½ cup brown sugar, ½ cup almond oil, ½ teaspoon vitamin E oil to it and also a few drops of orange essential oil and mix them all well together. And use this scrub on your face often to get the natural glow. If you have been a sufferer of the dry skin, then this homemade face scrub recipe will be a great choice for you to try on your skin. This can be your best face scrub for dry skin. Oats will work as a great exfoliating source for your skin removing dead and dry skin cells from your skin. Crunch down the uncooked oats into small bits but not into a complete powder, you can do this by simply thumbing them with a wooden roller. If you took ¼ cup of oats, you have to take 1/8 cup of honey, 1/8 cup of olive oil. Mix the ingredients well together and use this paste to face scrub. Chocolate is not only the yummiest ingredient and the favorite food for girls, but it even has some other beauty benefits that we don’t know about. 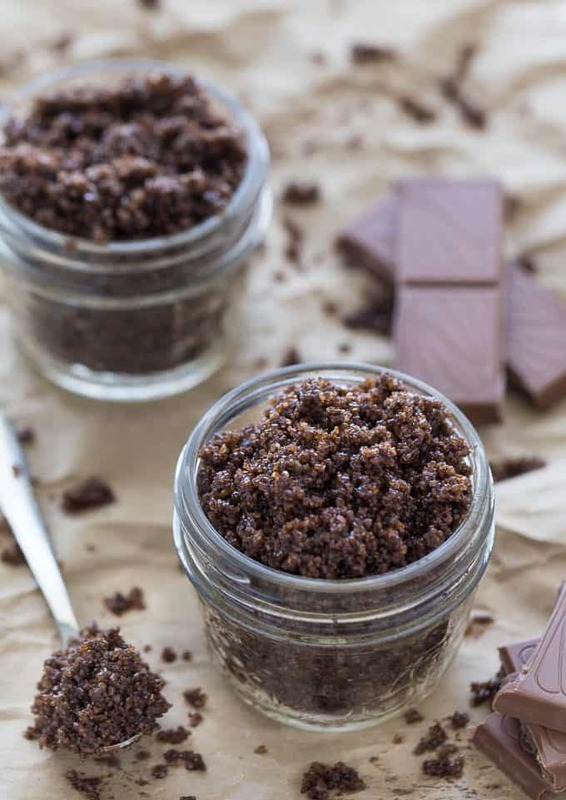 Chocolate works great on your skin and this scrub with chocolate will make it glow. The ingredients may make you feel like you are preparing some really delicious recipe, but these are actually going to make a great homemade face scrub. Take ¼ cup of brown sugar, 1/8 cup of olive oil, 1 tablespoon of cocoa powder, ¼ tablespoon of vanilla extract and mix them all well together. Apply the well-mixed paste on your face and rub it gently and leave it to try for about 10 minutes. Then rinse it off with warm water. 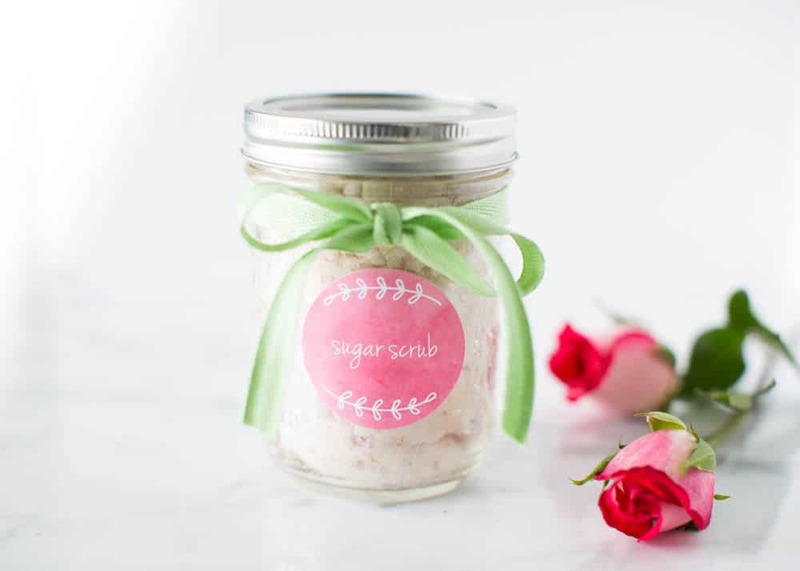 Rose is a very nice ingredient for your skin and if you would like to give your skin a rose shine and glow, then you must definitely try this face scrub recipe with the simply available ingredients and easy process. The process is pretty simple, all you need to do is just mix the 1 cup granulated sugar with ½ cup coconut oil, a few drops of rose essential oil, vanilla seeds, and chopped rose petals all well together and then use it as a regular face scrub on your face. An almond and honey face scrub is the easiest DIY beauty product to make. And yes, it’s delicious, too. It is soft on your skin and my face definitely looked healthier after the dull layer of dead skin was gone (eeek, I know). It gives you that special glow that shows you’re fresh and full of energy! Almonds are great for hydration and will exfoliate your face kindly. Honey is also hydrating and has the superpower to kill yucky bacteria – because we don’t want any of that lying around! Mix it all up and scrub your skin in small circles. Remember to do your neck and chest as well as your face. Leave the mix on your face for a few minutes to get all the benefits from its ingredients and then wash as usual. 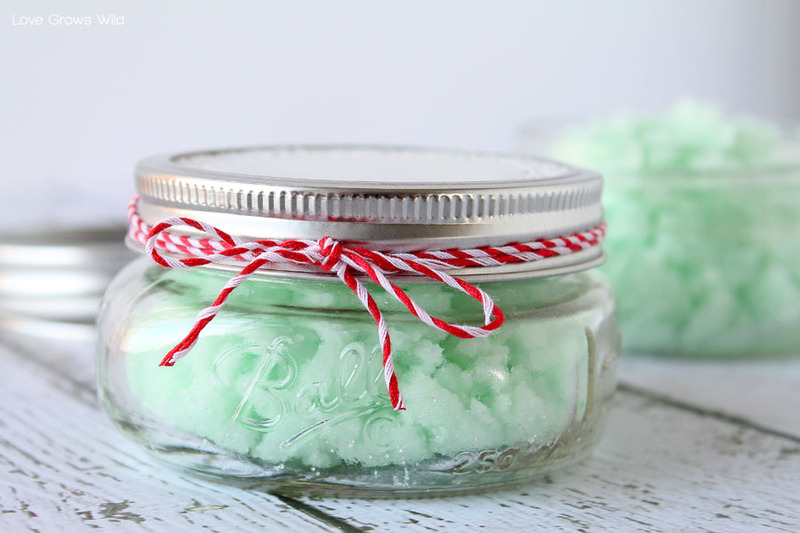 The mint sugar scrub recipe is very easy to make in a few simple steps. It actually smells great and is very good for your acne spots, acne on your face. Start by adding 1½ cups sugar to the oil, along with the peppermint extract and green food coloring. Mix until ingredients are well combined and food coloring is evenly distributed. If the mixture is too wet, add another ½ cup sugar until scrub is to desired consistency. The edible tomato considered as both fruit and vegetable is one of the widely used staples in all dishes worldwide. Apart from food, whenever a beauty compliment is given tomatoes are usually to compare with. The bright juicy vegetable is beneficial in enhancing beauty. Exfoliating skin with tomatoes is effective in promoting healthy skin, cost-efficient and is as simple and ready as a child’s play. Clean and wash tomato, and slice them thin. Dip the tomato slice in a tray of sugar where all the sugar granules sit on the vegetable slice. Now rub the sugar dipped tomato slice to your face and neck in circular motions. Let the process be carried slowly and mildly without harming your skin. Continue exfoliating for 10 minutes and wash out your face with plain water. Another way of preparing tomato sugar scrub is to blend tomatoes into a fine puree. Add a decent amount of sugar to the puree and stir them well. The rest is the scrub with the prepared paste and rinse away after drying. Moisturising skin not required as tomato has a high water content that hydrates skin. 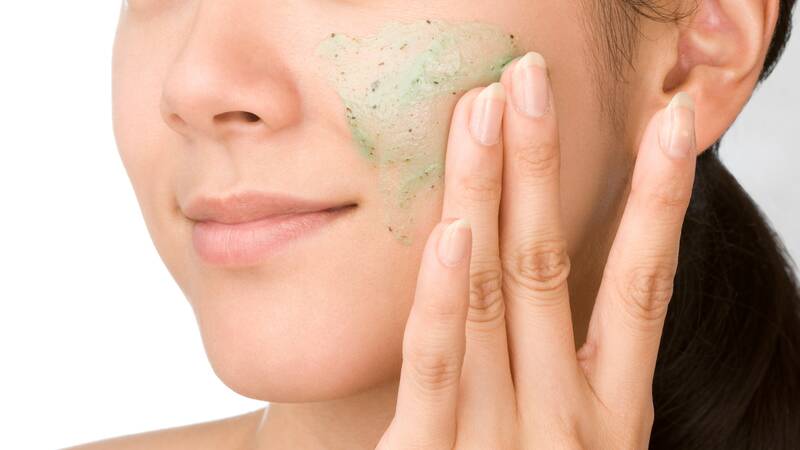 So, we hope these simple to make homemade face scrub recipes help you in staying beautiful.